Hi, and welcome to Kirk Emry Fitness. I am Kirk Emry, CPT-CSCS. As your Certified Personal Trainer, it is my responsibility to assist you in reaching your fitness goals. 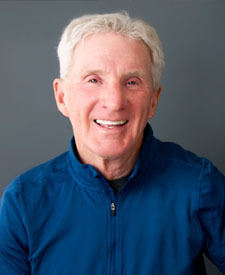 Whether you are a baby boomer who has not worked on your fitness since your high school PE class, a senior who wants to improve your balance and prevent the chance of a fall, or a middle or high school student who wants to get fit to try out for a club soccer team, I will be your coach, instructor, trainer, friend and motivator. I am sincerely committed to making your fitness goals my highest priority. I am a Colorado native and have actively enjoyed vigorous outdoor activities in our beautiful state since my youth. An avid skier, I have enjoyed working as a full time, Certified, Professional Ski Instructor teaching adults and kids ranging from ages 7 to 18 to ski at Winter Park Resort, Vail Mountain and Eldora Mountain Resort. I love hiking in the mountains and have reached the summit of 35 of Colorado’s famous 14ers. My regular fitness routine includes resistance training, running, hiking, cycling and dancing. I continue to participate in running events from 5Ks to marathons and challenging mountain trail races. I have significant experience as both a teacher and a coach in public middle schools and high schools. I have coached a variety of sports, including football, basketball, wrestling, baseball and track and field. I have also managed the strength and conditioning programs at several of those schools. I have personally been involved in fitness activities since I entered the sixth grade. I live, work, and train in Boulder, Colorado, and work also with clients in surrounding areas.